Ammar S. Bafi, MD, is a highly experienced cardiothoracic surgeon at the MedStar Heart & Vascular Institute at MedStar Washington Hospital Center. He is a member of the American College of Surgeons and the Society of Thoracic Surgeons. As a cardiothoracic surgeon, Dr. Bafi treats adult cardiac surgical disease, such as valvular heart disease and coronary artery disease, through the use of advanced surgical techniques. Dr. Bafi specializes in mitral and aortic valve repair as well as off-pump coronary artery bypass grafting. He performs approximately 400 to 500 heart surgeries per year. 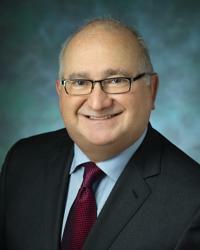 Dr. Bafi has built a reputation of excellence throughout his time with MedStar. With more than 20 years as a dedicated principal attending cardiothoracic surgeon, he has performed more than 8,000 heart operations with superb results, exceeding the national average. His clinical interests include the continuing development of best practices in mitral and aortic valve repair and off-pump coronary artery bypass grafting, in order to continue to grow and improve the MedStar Heart & Vascular Institute at MedStar Washington. Dr. Bafi is currently a principal investigator and a co-investigator in multiple device clinical trials at the Heart & Vascular Institute. He is widely published in medical journals and is a member of the Cardiovascular Surgery Program Quality Improvement Committee at MedStar. Dr. Bafi received his medical degree from the George Washington School of Medicine before completing a general surgery internship at the North Shore University Hospital/Cornell University Medical Center. He then returned to the George Washington University Medical Center to complete a six-year general surgery residency, which included one year of research. Finally, he completed a specialty three-year residency in cardiothoracic surgery, including one year at the Cleveland Clinic Foundation. Dr. Bafi is an advocate for increasing the treatment of valvular heart disease, and especially, for promoting excellence in mitral valve repairs. He works with a team of skilled interventional cardiologists that continue to bring novel treatments to the patients of MedStar. The team is currently interested in exploring the frontiers of hybrid procedures, more specifically, combining percutaneous methods with open surgical approaches in order to treat structural heart disease. "Growing up as a child of diplomats, I lived in different countries. As a part of this experience, I learned to appreciate and develop a wide perspective on people, religions and cultures. I believe this contributes to my ability to connect and empathize with my patients and colleagues. "What drives me is knowing that every day I'm working to improve the quality of life for my patients. I enjoy my work because it requires the ability to solve complex problems. My training, in addition to the support of my colleagues, allows me the privilege and the honor of having a positive impact on my patient's health and their lives." Dr. Bafi successfully removed a damaged valve from the heart of the husband of Dr. Sandra Swain. He was part of a team that helped save Steven Jones' life.